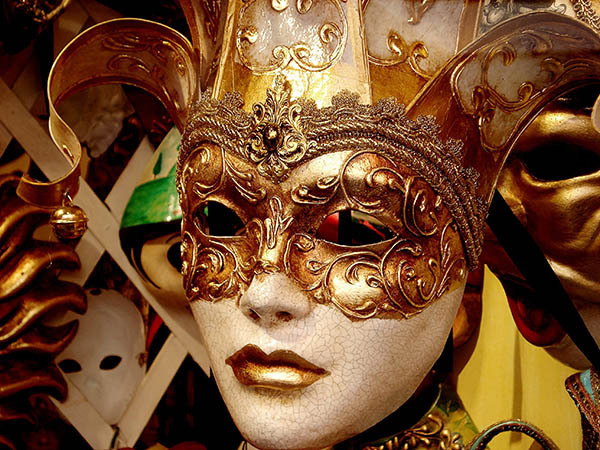 In about one week the Carnevale di Venezia will be celebrated at Machiavelli. The event includes magnificent costumes and masks, a special menu from Chef Gian Pietro Ferro, and a special live music program. It lasts from February 17 – 25. During each night of the celebration, guests will be provided with premium selections from the Carnevale di Venezia menu, including starters like Insalata di Granchio alla “Veneziana,” fresh crabmeat salad with scallions, radicchio and citronette, pasta like Casunzei “Ampezzani,” a specialty of the Dolomite region of the Alps consisting of mezzaluna pasta stuffed with red beets and ricotta, coated in a butter and poppyseed sauce. Entrées include Branzino Royale con Radicchio e “Teroldego,” sautéed filet with radicchio in Teroldego wine sauce, and for dessert Fritelle Veneziana, which are traditional Venetian carnival fritters similar to American funnel cake. Special wine selections will be offered from Tre Venezie, a cluster of wine regions in the northeastern part of Italy. Guests are encouraged to wear luxurious medieval garb and masks which fit the style of the Venetian Carnevale. The atmosphere will be topped off by the artisan-designed décor evocative of the Italian Renaissance.